I have a site I go to occasionally (mountainroseherbs.com). Now I am getting the message shown above in the subject line. I tried Firefox and have no problems. I can go to their blog mountainroseblog.com and open it fine, but when I click on their mountainroseherbs link in the blog or just type it into my address line, it doesn't work in Safari. Any ideas? Strange. I do not want to upgrade Safari nor do I want to reset Safari. In Safari 5.1.10 (in Snowy) I can access your website, but before I do I have to get past this. If it has something to do with your problem somebody else will have to explain why. I've gotten that message occasionally with other sites but not with mountainroseherbs. I can't figure why it's happening now and only with Safari. It looks like earlier today they had an invalid security certificate, but as of 12:13 AM on December 9, when I tried it, it's been fixed. That was probably the problem. Are you still encountering difficulties. Yes, still having the problem. I just tried it and cannot connect via Safari but can do so via Firefox which I only use when something like this happens.Thanks. 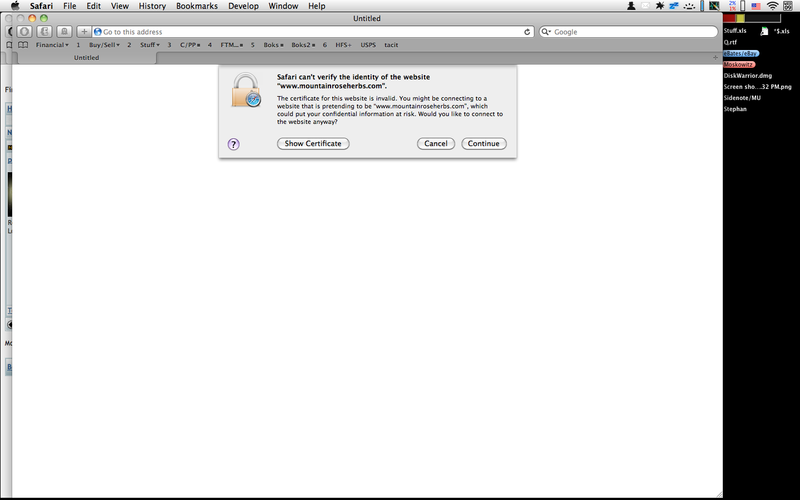 Security certificate is still invalid as per my Safari 5.1.10, but dunno what-all it means. I see you are in 10.9 with an old version of Safari. There can be issues with the web page that an your version of Safari cannot handle. Why do you not want to upgrade Safari (only)? I don't want to upgrade because it seems every time I do I lose a feature that I like. The last time I upgraded I lost the feature that would automatically fill in forms that otherwise couldn't be filled in automatically. Now I don't have that. Some forms will be filled in, but others not. I really miss that feature. Artie has an older version than myself and he can get in. I just don't get it, Ira. I emptied my cache to see if that would make a difference but it didn't. I don't want to upgrade because it seems every time I do I lose a feature that I like. I am totally up to date with my OS and Safari but still sometimes will come to a page that doesn't like Safari. I work around that by having another browser open the page while I am at the page in Safari. You need to use the "Develop" menu. This menu is normally hidden but is easy to put into the menu bar and just as easy to use. 1. First, open Safari's Preferences (under Safari in the menu bar). 2. Click the 'Advanced' tab (Icon on the far right). 3. At the bottom of the window is 'Show Develop menu in menu bar.' Check it. Then the heading "Develop" will appear on the menu bar between "Bookmarks" and "Window"
The first choice under Develop is "Open Page With". If you have another browser(s) installed on your drive you can open the problem page with one of them. You will still have Safari open and, once you're done at that page, you quit the other browser and carry on with Safari. I have Firefox and Chrome installed on my drive. Their only purpose is to deal with pages that balk at Safari. Another trick from the Developer menu is to click User Agent. That gives you a choice of browsers that Safari will imitate. In other words, Safari tricks the site into thinking that it's a different browser (for example, Internet Explorer). You may have to refresh the page to see if it works. FYI the reason that works is that some web pages serve different html to you depending on what browser you're using, usually in an attempt to work around bugs either in their web page or your browser. That usually works well initially, but months go by and browsers get updates and suddenly that "fix" they customized for your browser (a hack of a fix) stops working, and the original html will now work instead. But the web site continues to send you the hacked html so the page doesn't work right. If you lie to the site and tell it you're not using that browser anymore, it stops sending you the hacked code and things will look right. And you may have to do that for awhile with that site, until they figure out they can turn off that browser-specific hack. Very informative, V1. Thanks for posting this. Another trick from the Developer menu is to click User Agent. That gives you a choice of browsers that Safari will imitate. I didn't know about that trick. I'll give it a try next time I bump into a problem page. Good one….thanks. FYI the reason that works is…. And thanks for the explanation. I love that trick. Thanks! I'm learning so much. Thank you. More great info. So helpful. Why Safari fails to load or run properly in Safari can be complicated. I have had success "fixing" balky sites by turning off extensions. Turning off extensions in older versions of Safari was on the standard menu bar but in Safari 9 that has been moved to the Develop Menu Ryck mentioned previously. If turning off the extensions works, you can disable them one at a time in Safari > Preferences > Extensionsons until the offender is identified. The settings for Cookies can also cause problems with a few web sites. Hi: I just tried turning off extensions and it didn't work. I didn't mess with cookies but under the Develop Menu using Open page with (FireFox) works great. I can't imagine what Apple was thinking when they hid the On/Off switch, but be that as it may, I've been almost universally successful at resolving this sort of problem by turning Ghostery off right from my toolbar as a first step. Apple has an OCD for simplifying interfaces, mainly in the interest of improving aesthetics. Often it adds inconvenience for a few, but occasionally for many. Artie: My Ghostery is ghosted out (LOL) on my toolbar on some sites, including the one I mentioned that won't load up. So I can't turn it off from there. I have to go into prefs. It's a pain. It seems to work on this site just fine. I didn't even know I could turn it off from the toolbar, so thanks for that. I just visited your site, and Ghostery showed 5 items blocked. I don't know why it's ghosted ( ) out anywhere. Have you got the latest version? I believe I have the latest one for Safari - Ghostery 5.4.8.1. I saw a 5.4.8.9 version for Firefox but that's it. It occurs to me the later releases of Ghostery (and very likely other extensions) may have compatibility issues with an older version of Safari such as the one plantsowner is using? Generated in 1.799 seconds in which 1.373 seconds were spent on a total of 15 queries. Zlib compression enabled.